Feathers of sunlight escaped a quilt of clouds in the early afternoon. I used my usual half-hour lunch break to wander the streets of downtown Missoula, soaking in a bit of daylight before the clouds closed in and it was time to return to the desk, until 5 p.m., when the sun sets. That's when I planned to go back out for my two-hour run. "The winter darkness is hitting me harder this year than it did last year," I confessed to a co-worker later in the afternoon. "How is that?" he asked. "Last year, you lived in Alaska. 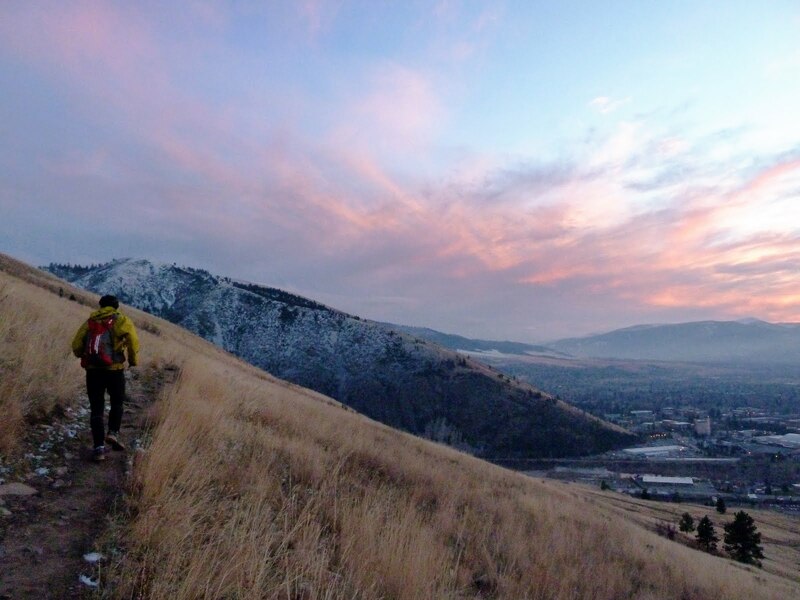 It's lighter and warmer in Missoula." "Actually, it's not either," I replied. "Well, I guess there's technically more daylight here. But I don't often see any of it. I go to work just after the sun rises and leave just before it sets. When I lived in Juneau, the sun set at 2:30, which was also about the time I went to work. So I had all of the daylight hours to myself, every single day. I miss that schedule. Whoever decided 9-to-5 should be standard work hours is not a friend of mine." And the more I think about it, the more I realize how much this work schedule has affected me. At first, going out after sunset had a novelty to it. The trees carved spooky silhouettes, and darkness and moonlight cast familiar trails in new ways. 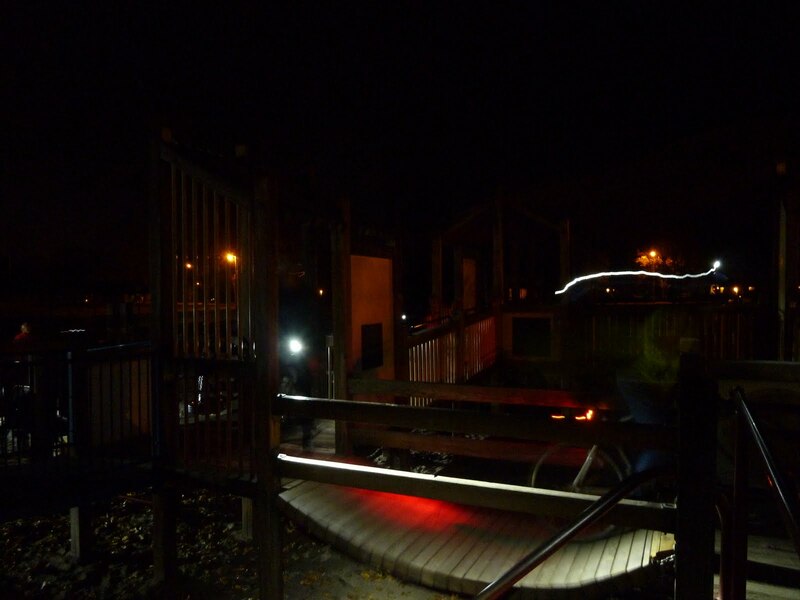 I acquired a fancy new bicycle headlight, a new headlamp, a slew of batteries and red blinkies, and resolved to make the most of my new, dark world. But then the novelty wore off, replaced by a discouraging sameness. 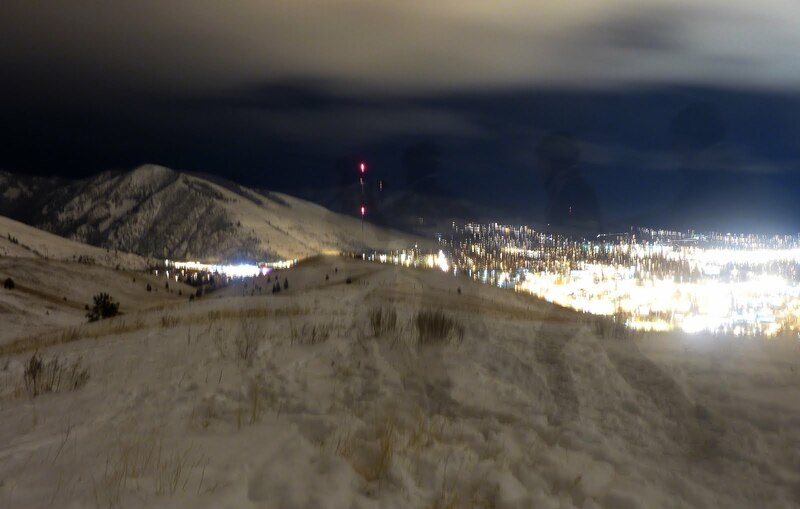 I realized there was little more to see than the narrow island of my headlamp beam, and blinking red lights from distant towers on the mountains. I started leaving my camera at home, because there was nothing to photograph. This was a telling gauge of my enthusiasm. Biking — and running — isn't necessarily about exercise or fitness for me, it's my way of exploring the world. When my camera stays at home, so does my motivation. I feel less excited and more fatigued. I look for excuses to turn around. It doesn't bother me that it's 10 degrees out as I run through wafting snow. I genuinely don't mind going out in the cold. What I'm discovering about myself is that I don't necessarily enjoy going out in the dark. This is actually a big reason I decided to take up running, which involves less prep time, and less overall time for similar fitness benefits. 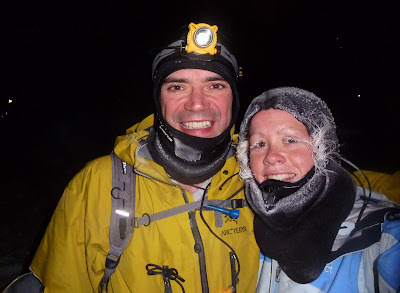 Then I picked an impossible goal like the Susitna 100 to serve as my main motivator. I know I have a long winter in front of me. Perhaps I will grow to love the night, appreciating the tiny details — the mounds of snow, the flecks of ice — as much as I used to relish expansive views and blaze blue sky. Somehow, I doubt it. But I am thankful for healthy legs to carry me through the snow, for an iPod to stave off the creeping boredom, for my boyfriend and Missoula friends who are often willing to keep me company in the dark cold, and for a camera with a self-timer for those occasional creative impulses that allow me replace actual photo opportunities with personal experimentation. It's all biking and running, and it's all good, even in the winter. An overstuffed Subaru Forester with four adults and only one set of skis attached to the roof rack pulled up to the tiny border crossing in Roosville, Montana. 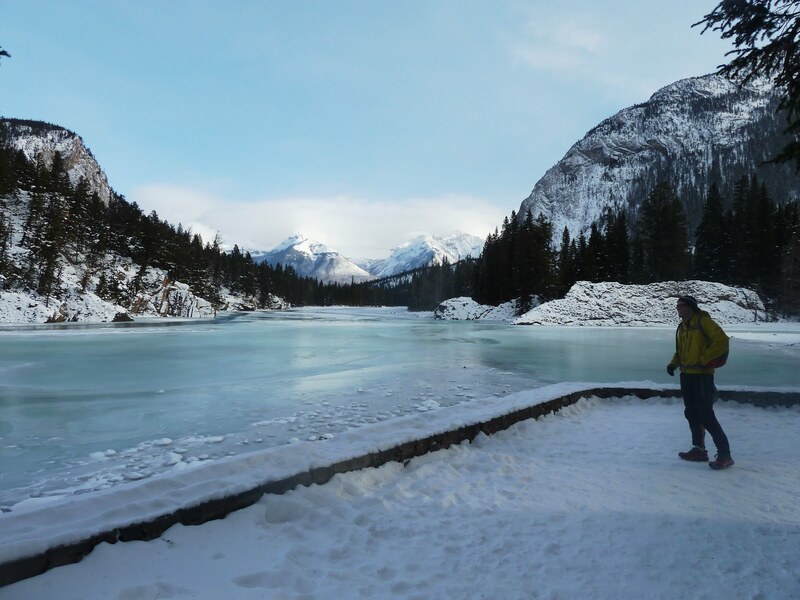 The Canadian border guard stepped into the single-digit cold, collected three American passports and a Swiss passport, and boredly rambled through his routine. "Um, we're from Kalispell, she's from Missoula, and he's from the Bay area," said Ted, the driver. "And were are you going?" "And what is your purpose in Canada?" "We're going to celebrate Thanksgiving." (Long pause.) "Um, American Thanksgiving." It sounded suspicious, even to us. We smiled and held our collective breath. The border guard returned our passports and without another question, said, "Welcome to Canada." And thus began our holiday in Canada that our Canadian friends dubbed "Yanksgiving," because in the Great White North, the harvest holiday is celebrated in October, not the frigid end of November. That didn't stop them from inviting Danni, Ted, Beat and me up for a four-day weekend full of hiking, running, tons of food, running, candy, more food, running, huge 70s-theme disco extravaganza party, food, and plenty of sunshine. We woke up early Thursday to a daunting blizzard of a Thanksgiving storm. The trip required a 120-mile drive from Missoula to Kalispell in my 1996 Geo Prism with its summer tires and general lack of stamina. Early in the morning, the snow on the road was so thick I couldn't tell pavement from fields from sky. Everything was a monotone gray in the pre-dawn darkness. My abs hurt from being clenched so tight during the four-hour drive, and more than once we came seconds away from just turning around and giving up on the entire weekend. 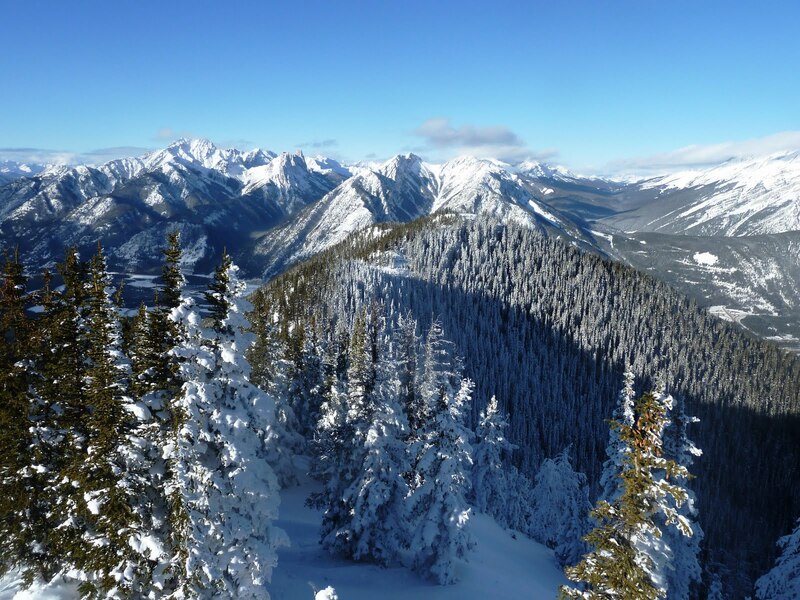 But we kept at the slow crawl north, trading Geo for the Subaru in Kalispell, and by the time we crossed into British Columbia, bright light began to shine through patches of blue sky. What can I say? Canada loves me. I've been back to this country enough times now that the weather hasn't been fantastic every time, but my ratio of sunshine and nice temperatures is still well above average. Beat had never been to Canada before, so we made a point to stop at Tim Horton's for Thanksgiving "dinner." It was just a regular day at the donut shop in Invermere, with nothing containing turkey on the menu. 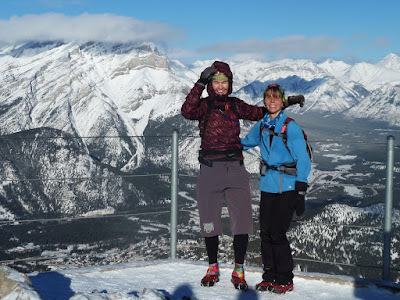 We made up for it by eating turkey jerky in the car, then headed for a night hike up Sulphur Mountain almost immediately after arriving in Banff. On Friday morning, Leslie, Beat and I went for a run on the Spray River trail. The Spray River trailhead is the beginning of the Great Divide Mountain Bike Route, and the parking lot is the starting line of the Tour Divide. 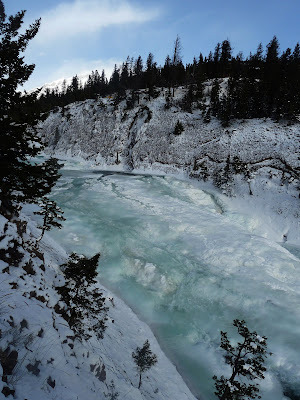 For all the times I've been to Banff, I actually haven't been back to the Spray River trail since June 2009. 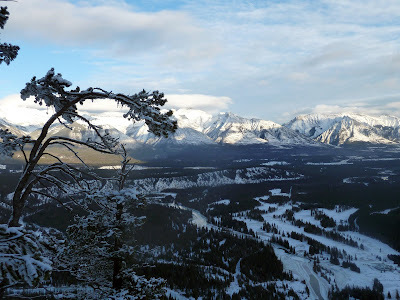 It was fun to return to the familiar scenery, now drenched in snow and winter light. The Spray River trail itself was quite soft, which made for a surprisingly strenuous 11K run, on top of another 6K or so we did in town and around the nearby woods. 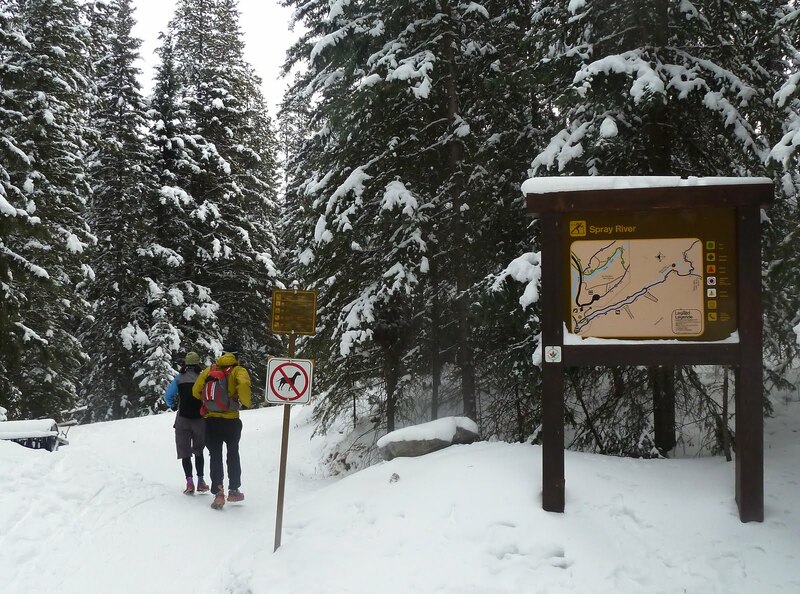 (Note to skiers: Yes, this is a multi-use trail.) I felt like I was working harder for less speed than the night before, when we gained 2,500 feet in 5 kilometers, also on snow. 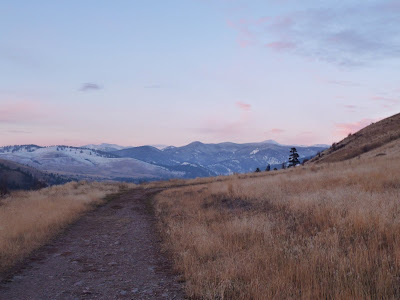 It was a revealing run — both that winter training should emphasize time on feet, not mileage, and that trail conditions will actually have to be pretty good for me to have a chance of finishing the Su100 on foot. Keith ("my TransRockies partner"), Beat, Leslie and I went for a tour of downtown, including a trip to a specialty wine store where Beat and I disinterestedly paced around the periphery, and an international candy shop where we greedily purchased at least 20,000 calories of sugar. On Friday night, the Canadians came over for Yanksgiving dinner, which Leslie graciously cooked in its near entirety: An whole turkey, yams, scalloped potatoes, Brussels sprouts, rainbow vegetables, corn, cranberry sauce, and fruit crumble. On Saturday we got outside for a big effort, and Banff handed us a perfect bluebird day. 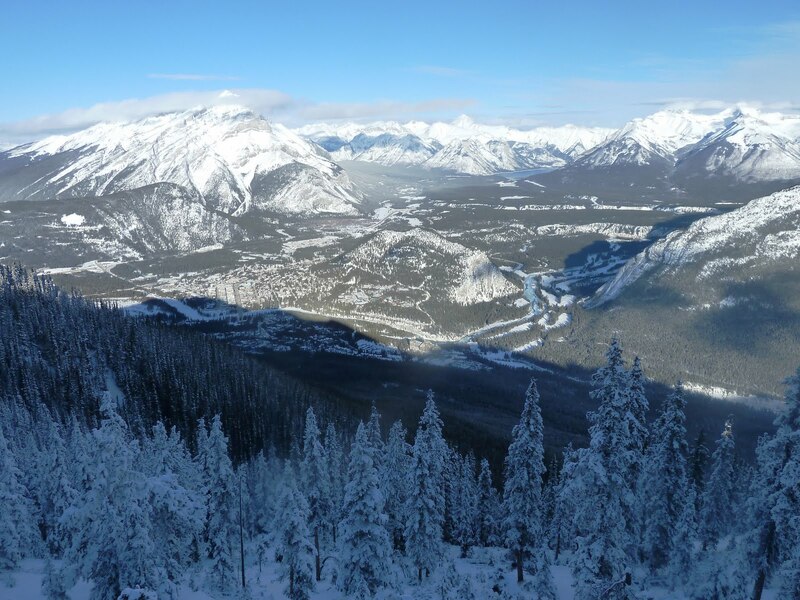 First stop was Sulphur Mountain. Looking out over Banff and the Bow River Valley. 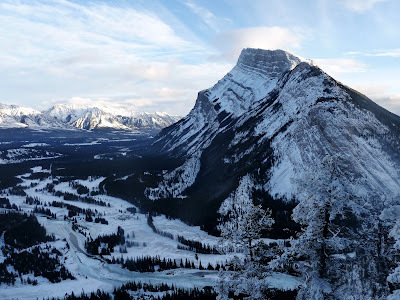 That little mound in the center of the picture was to be our next stop — Tunnel Mountain. Beautiful country in the summer and winter. 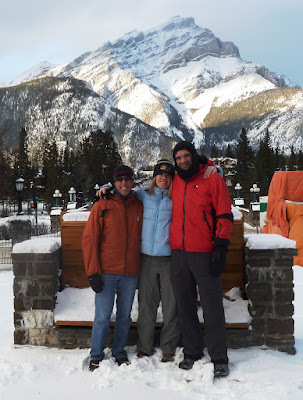 I figured out I've visited Banff a surprising seven times since my first stop in June 2009. I often visit the same trails, and I still can't get enough of them. Leslie and her friend Iris stand on top of Sulphur, trying to stay warm. I felt like a bit of an impostor among all of the real runners. Here is a view of the Bow River Valley from the top of Tunnel Mountain. 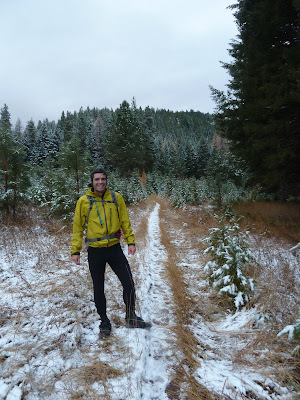 I'm not sure about the total distance we did, but it was about 4,000 feet of climbing and descending, mostly on packed snow trails, in just over four hours (with some tourist sightseeing on top of Sulphur.) The temperatures all weekend were seasonable, with highs near -8C and lows around -17C. My left foot hurt afterward, probably from running with an ankle brace, but it was my longest run yet and I think it went well. Saturday night offered the overall purpose of the journey, which was not, in fact, to celebrate an American holiday, but to celebrate several milestones (a 40th birthday, 20th anniversary, and nursing school graduation) with our friends Dave and Brenda. 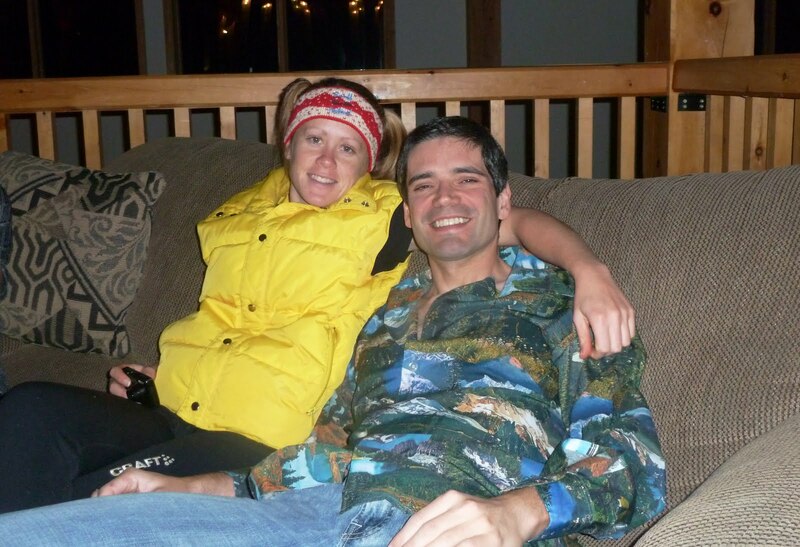 They threw a huge '70s-themed party up at a ski resort. I didn't bring a costume and so I had to cobble together something that ended up being more of an '80s ski bunny look. What you can't see in the photo are my white moon boots, which were the best part of the costume by far. We ate cupcakes and danced into the night, and my ski bunny outfit was perfect for walking the mile-plus home from the bus stop. Fun weekend. I'm always thankful to visit my "home" in Banff. 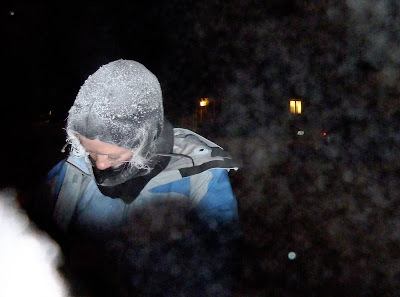 Not only am I new to the idea of running as a form of physical training (rather than as a last-ditch method to catch a tight flight connection), I am new to dressing for comfort in cold weather while running, necessary knowledge to have when training for a cold-weather race. Last night provided the perfect opportunity for gear testing: Low, low single digits dropping into the negative single digits. Step 1: Never start a run without taking advantage of an opportunity to test some new, preferably slightly ridiculous cold-weather strategy, such as ways to keep water from freezing solid. Taping a Camelback bladder to your skin can work, as long as you're not opposed to carrying around a cold, sloshing water baby. Step 2: If you are using a more traditional method for protecting water and gear, such as a wedging a backpack inside of a coat, make sure you can actually fit your coat around all of the crap you want to wear and/or bring with you. Step 3: Don't forget the loose final pieces such as gloves, hat and headlamp. Don't worry that you look like you're about to go deep-sea diving. In a way, this is essentially what you are doing. 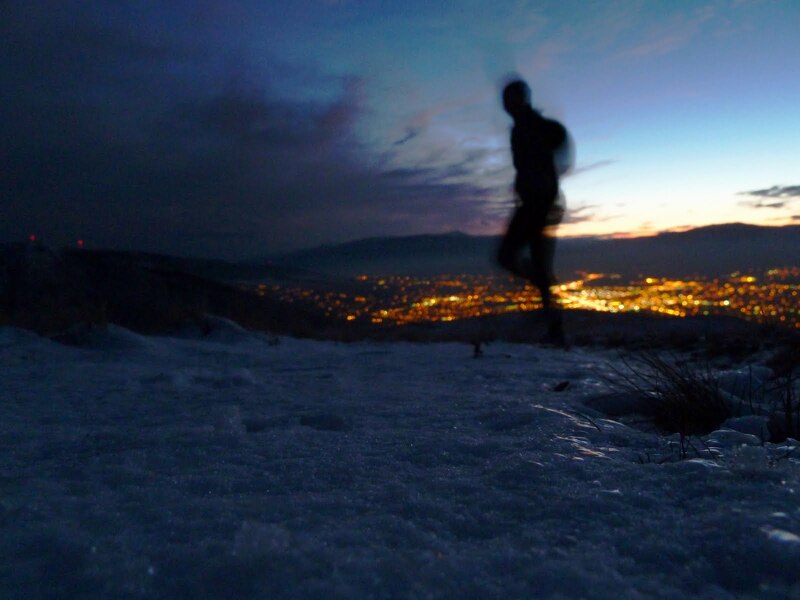 Step 4: After warming up by running through the city streets, don ice creepers for the run up the mountain. If you are a mitten user, it is preferable to practice this step a few times before you go out into the Arctic cold. Step 5: Be sure to look around and enjoy the views. After all, you could be inside a warm building, jogging on a treadmill as you sip herbal tea and watch "Dancing With The Stars." Step 7: Don't make the mistake of believing you're done after you've descended the mountain. After all, you still have three miles of cool-down (way down) before you return to the safety of home. Note: This is a surprisingly long way when you don't have wheels. Step 8: Relish in the fact you spent two hours and 15 minutes braving the elements, which is actually much more fun than simply exercising. Vow never ever to bother with treadmills or trainers again, and begin plotting tomorrow's run. I expected to feel something like euphoria after completing the Sustina 100, but found the experience to be closer to the opposite of that. Geoff loaded my bike in the back of the truck as I stood in the bright sun with my head lowered. My skin felt clammy and chapped, my lips and mouth parched. Geoff gave me a Diet Pepsi, a special treat, but the cold liquid tasted like fire and sea water — a result of extreme electrolyte imbalance, mild nutritional deficiencies and of course dehydration. I was out of energy but I had no appetite. Geoff produced a cold pizza — he purchased it the evening before when he expected me to finish around 2 a.m., not 10 — but I couldn't even choke down a full slice. We drove in mostly silence an hour back to Palmer, where I peeled off my still-wet clothing and prepared to take a shower. My hair was wet and so knotted around my hair band that I couldn't untangle it. My bloodshot eyes stared back at my blotchy face in the mirror. I tried to yank my hair free until I broke out in tears. Every muscle in my legs throbbed. I felt like I had deliberately thrown my body into rush-hour traffic, and finishing the Susitna 100 seemed just as masochistically useless. "The edge with which I am dancing is where the mind can make the body perform beyond what is believed to be possible. It is spiritual, it is dreamlike, it penetrates to my core and when I come back from it, I know I was there, and it beckons for months afterward ... At the finish line in McGrath, the physical and the emotional unite in a crescendo of emotion, pain, elation. The "other" becomes a memory. This unique reality has been reached by the passage of miles, time, physical exertion, psychological strain and sleep deprivation. It is so close to me, yet a world away." 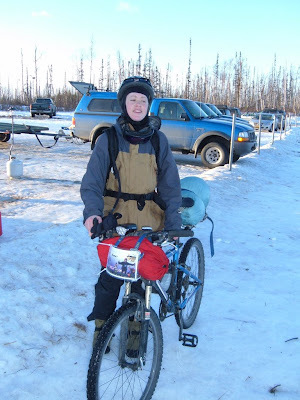 In 2007, I went back to the Susitna 100 much more prepared — except for I was overtrained, and finished the race with stage 3 chondromalacia in my right knee that kept me off my bike for more than three months afterward. In 2008, I took the quantum leap to the 350-mile race to McGrath, grossly underexperienced and underprepared, and finished the race after what is still the most intense six days of my life. 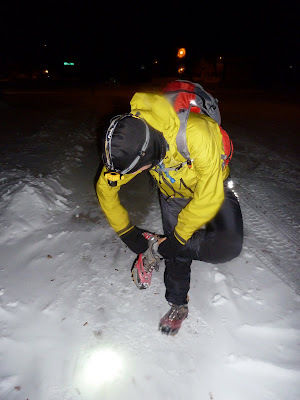 In 2009, I returned to the race to McGrath with much more experience and preparation, and contracted frostbite on my right foot within the first 60 miles. Later that summer, I finished the 2,740-mile Tour Divide after 24 days of physically exhausting, often painfully lonely pedaling, convinced I had my fill of adventure racing, finally, and I didn't have to do it any more. The temperature was 8 degrees and 25 mph winds plunged icy flakes of snow like daggers into my skin as Beat and I slipped micro-spikes over our shoes and started up the exposed hillside on Monday evening. After our seven-hour snow-bike adventure on Sunday, my legs felt heavy and sore. Something similar to wet concrete and cold acid pumped through my veins. 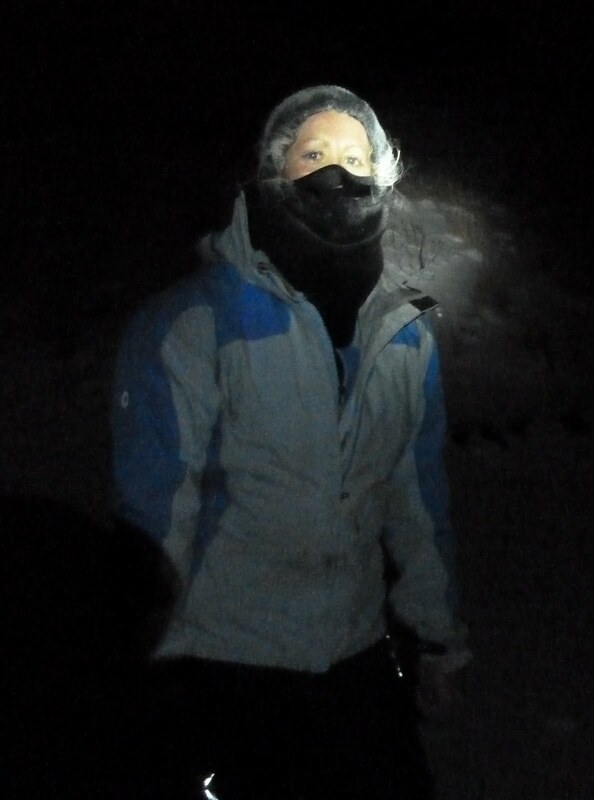 I adjusted my face mask to block the fierce windchill, lowered my head and shuffled behind Beat up a gravel road where I've ridden my mountain bike several dozen times. Powder snow drifted like sand under my feet. I was running, but only barely. Climbing this hill had never been so hard. 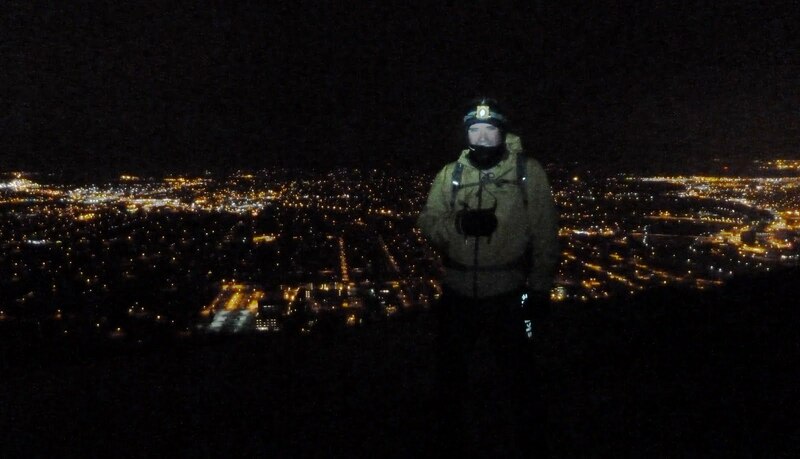 We turned left and traversed the face of Mount Sentinel as an eerie blur of city lights glowed through the blizzard below. We reached the ridgeline where the full Arctic blast roared through Hellgate Canyon. With hands and spikes on ice-crusted rocks, we picked our way up the mountain. Beat said it felt like mountaineering. I felt like I was slapping my own legs with a spiked paddle. It had been barely a week of mild running and hiking since I started to recover my sprained ankle, and already my body was seriously sore and tired. The cold was not much of a concern for me. But my speed was. 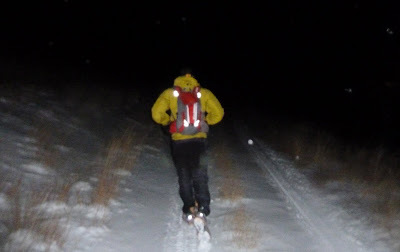 Our 12-mile loop was going to take three to four hours at my pace, something a little beyond the cold-weather and physical exposure both Beat and I felt was prudent for a weeknight training run. We turned back. I stumbled several times. We returned after an hour and 40 minutes — an amount of time that would be a "short weekday quickie" if it were a bike ride — and I felt spent. On September 1, after much mutual goading, my friend Danni and I both registered for the 2011 Susitna 100. The simple action of hitting "send" on the Web site filled me with the same raw anticipation that I felt five years ago, the same anxiety and excitement of the prospect of venturing into almost completely unknown — and for me, completely ridiculous — territory. Yes, I've finished the Susitna 100 twice (on a slightly different course, but still in the same region.) I still sometimes dream of it, with jolting lucidity, when my mind slips into the gray spaces between wakefulness and slumber, and I remember the childlike awe and wonder. I want to return that space, back to the beginning, with a similar state of mind. I want to venture far out of my comfort zone. I want to leave my bike at home, the one tool that has gotten me through so much. I want to strike out into the tundra with only my own body to rely on, maybe with my friends Danni and Beat, or maybe alone, to see the windswept Dismal Swamp in new light, with new eyes. In other words, I want to run the Susitna 100. On foot. And after a fall marked with more injuries than actual training runs, continuing struggle with simple efforts, and a general complete lack of running experience, I have absolutely no reason to believe I can even attempt it, let alone finish it. But I had no reason to believe it in 2006, either. About a half mile from Rich Crain’s tent, I rounded the cliffs of the river bend and plunged back into an all-encompassing darkness. 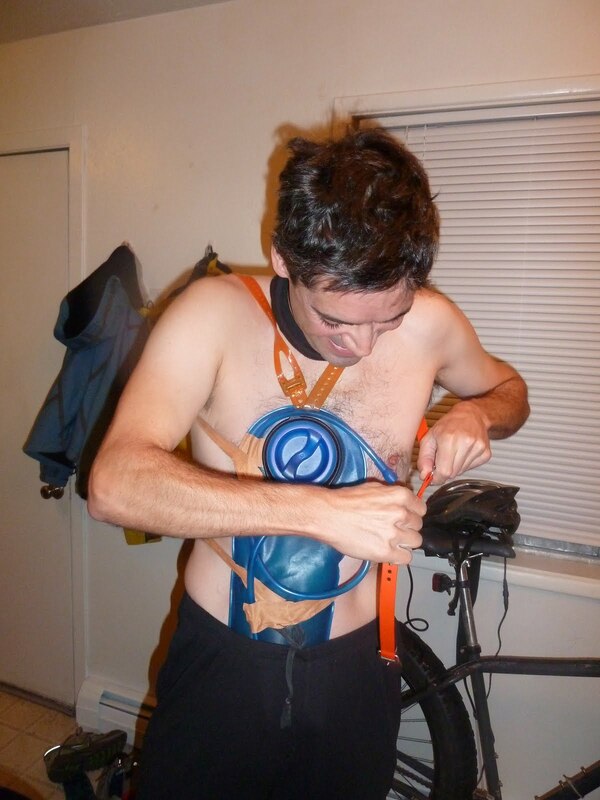 I stopped to tighten my seatpost rack and contemplated changing my base layer. There was a strange chill in the air. I couldn’t quite place it. It didn’t feel like bitter cold, frosty or sharp; it was more of a dull, penetrating chill that saturated the air. I looked up at the starless sky and felt tiny needles of moisture bouncing off my nose and cheeks. Until that moment, I hadn’t realized it was raining. Rain! Rain wasn’t good. How often does it rain in Southcentral Alaska in February? I had planned for blizzards, I had planned for outer-space-like cold, I had planned for snow and ice and even sunlight, but I hadn’t planned on rain. The light drizzle picked up volume until large droplets were bouncing of my ultra-breathable — and therefore minimally water-resistant – shell. The trail’s thin crust began to break apart. I could feel my tires churning up slush, and then the bike stopped moving. I pushed it several dozen yards and tried to ride again, laboring and churning up slush until the wheels seized. I stopped, and then tried to pedal, then stopped again, and again and again. Yellow stakes veered up the riverbank and into the woods. I knew without a doubt that I was back on the same trail I had ridden in the early afternoon. But it was the same trail only in location; it no longer bore any resemblance to the smooth, icy path I had ridden earlier in the day. It had become a quagmire, swept with gray slush and occasional puddles of standing water. Ski and snowmobile tracks carved irregular ruts across the trail. My own wheels knifed into the trail like warm butter; riding was impossible. As I walked, I occasionally punched shin-deep postholes into the soft snow. The rain kept pouring down, like spray from an unseen waterfall, cold and endless. There is a place, a windswept plain between the Susitna River and Flathorn Lake, known as Dismal Swamp. As I pushed my bike, the bleak blank landscape sucked every last ounce of hope and joy out of my being, like a mystical crossing where the name isn’t ironic, it’s an actual warning. “Abandon all hope, ye who enter here.” The sloshing sound of my feet through the slush was maddening. I stopped when I couldn’t bear to listen to it any more. My legs throbbed with a low roar of pain. My feet were wet and hot where blisters were forming. My throat was raw and tingling from breathing so hard for so long. I hadn’t eaten anything since the frozen Power Bar six or seven hours earlier. I felt more ill than hungry, so I didn’t even consider eating anything else. Instead, I sat down in the snow and gazed at the bleak blank sky. A stream of cold water trickled down my spine. I held up my gloves and noticed they were dripping rainwater. So was my coat. My legs felt clammy and cold. I was officially, thoroughly soaked. The wet clothing did nothing to block the frigid wind from chilling my skin. I burrowed deeper into the drift beside the trail. I wanted someone to come rescue me, to whisk me away from this hopeless place. But I hadn’t seen a single other person besides Rich Crain since I left Luce’s Lodge. The chill seeped into my core. I started to shiver. Logic began to frantically wave at me from behind the hazy veil of my bonked daze. I knew I could abandon hope all I wanted, but I wasn’t going to last long being completely wet in 35-degree rainy weather if I didn’t keep moving. So reluctantly, I stood up. This is the part where my memory fades to an almost unrecognizable blur. Somewhere in the back of my primordial instincts, I found the strength to keep moving. Moving meant pushing my bike through the slush; nothing less, nothing more. It must have been hard work, because I do remember stopping occasionally to catch my breath and look up at the sky, straining to see stars that I never found. I must have stopped at Flathorn Lake lodge again, since that was the 75-mile checkpoint, although I don’t remember doing so. The checkers must have fed me some of their famous paella, or at least I assume they did, because for a while after Flathorn Lake, my mental images became much clearer. The rain turned to snow. Large chunky flakes fell on my wet clothing and clung to my eyelashes. The “slorp” sound of my footsteps became more of a crunch. Temperatures were turning more favorable, which simply meant they had dropped below freezing again. Would the trail set up? I shivered against the creeping chill. Shadows of black spruce trees plodded beside me. I didn’t want to listen to my footsteps anymore. 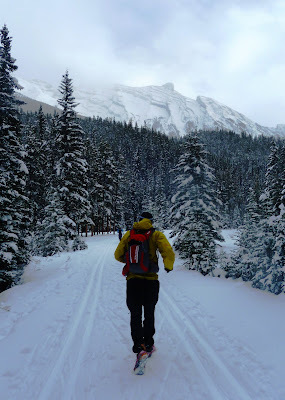 I took of my wet, snow-covered pack and fished out the little AM/FM radio I brought with me. I turned the dial, searching for the weather band. I wanted the familiar computer-generated voice to tell me the storm was moving on, the temperatures were falling, and the trail would freeze solid again. I caught a single, static-garbled report that the temperature was still 37 degrees in Wasilla, and then it cut out. I switched to FM. My radio found only one channel, a mainstream pop station out of Anchorage. I walked and listened. They played songs I remembered from high school, cheesy ballads that brought an actual if subdued smile back to my face. They played dance music that pumped life back into my flagging will to live and even prompted me to try to ride my bike again, which usually ended swiftly in swerving, crashing failures. They played the same damn “Yahoo Mat-Su” commercial so many times that I wanted to rip my ice-crusted hair out of my head. And then they played a song I had never heard before. “It’s coming up … it’s coming up … it’s coming up …” I stopped walking, held my breath, and listened. The music caught my attention in the way certain songs just do sometimes, a consuming blend of surreal melody, mood-matching rhythm and lyrics that spoke to the moment. “DARE” by the Gorillaz. Just another pop song, but it filled my slow march with rush of new meaning. I looked up at the sky and saw the eerie orange glow of Anchorage city lights reflecting off the low clouds. I licked my lips, cracked and crusty, and felt a strange kind of warmth, like a glow, starting from those city lights and seeping all the way to my soul. I pushed a grin through my cracked lips, and then I broke out laughing. I felt amazing; I didn’t think I had ever felt so amazing. I certainly never felt that way before, what I recognize now as endurance euphoria: the out-of-body elation one experiences when one has been so miserable for so long that even the tiniest hits of positive emotion feel like ecstasy. But because endurance euphoria only hits in the midst of prolonged misery, and because it is accompanied by extreme fatigue and poor nutrition and, in my case, the dangerous edge of hypothermia, it never lasts long. Soon I was back to being miserable again, pushing my bike through the crusty but still-soft slush, screaming at the “Yahoo Mat-Su” commercial but too lonely to risk turning my radio off. After a seemingly endless number of hours, the sun started to rise over the distant Chugach Mountains. I blinked against its strange ochre light, reflected off the thinning clouds. 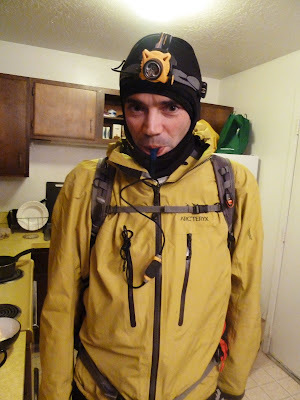 It meant I had been out there grinding away at the Susitna 100 for nearly a day, an entire day. Not only had I more than doubled the amount of time that I had ever spent engaged in an outdoor activity, but I had exponentially surpassed the amount of stress, fatigue, strain and outright soul-crushing tedium of any single effort I had every experienced. It was, by large degrees, the hardest thing I had ever done. And yet, it wasn’t necessarily getting harder. The dull pain and chill simmered beneath my limbs, but my transformed legs kept walking and my transformed arms kept pushing. Even while every cell in my body begged me to stop, I couldn’t help but wonder how far these new-found, robot-like abilities could take me. I returned to the dog-mushing park, where the well-used trails had set up in the morning cold, and mounted my bike again. For the first time in more than 25 miles, I was able to pedal for more than a few feet. I figured I couldn’t have more than five or six miles left in the race. Endurance euphoria crept up again, and in my excitement I failed to pay much attention to the yellow stakes that had guided me for 93 miles. After a half hour or so, I realized I hadn’t seen a yellow stake in a while. I rode forward another mile before deciding I really was on the wrong track. It’s quite common to become lost in an endurance race, especially if you’re me, but this was my first time and I took it badly. I turned around and sprinted back the way I came, fuming with anger and frustration and what suddenly felt like crushing fatigue. I backtracked three miles to another intersection, where there were still no signs of yellow stakes. I got of my bike, laid on the trail, and indulged in a screaming temper tantrum. That was it. I was ready to surrender. My odometer had surpassed 100 miles, and I didn’t care anymore whether I finished the race. The Susitna 100 could claim victory in this battle. I wanted out of this war. Out of the corner of my eye, I saw a skier whisk up a parallel trail on the other side of the swamp. I jumped up and followed the skier’s line until I found a yellow stake. I rode two and a half more miles and reached the finish line just after 10 a.m. 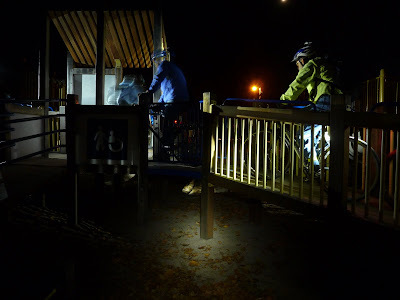 I stared in disbelief at my surroundings — a tiny warming hut, a crowded parking lot, and a sallow-faced race director standing in the snow with a clipboard. It was the same scene I had left 25 hours earlier, but somehow had become irreparably different. Geoff ran up to me and wrapped his arms around me. He snapped another picture and I tried to smile. My face felt frozen, my soul drained. I couldn't think of any words to say, except "I did it." Through my raspy voice, they echoed with a strange sort of hollowness. Somehow, some way, I was going to eventually have to accept that I finished the Susitna 100. 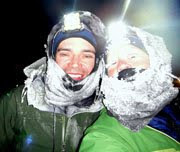 This is the continuation of my story of the 2006 Susitna 100. Morning light had not yet fully emerged at the 9 a.m. race start, although it was difficult to discern beneath the thick clouds that filled the sky. Snow reflected the dull gray, black spruce trees stuck out of the drifts like skewers, and the only thing that broke the winter silence was a tight cluster of about 60 skiers, cyclists and runners, perched at the edge of a colorless infinity. Geoff’s race didn’t start until 11 a.m., so he buzzed around shooting photographs. I was so nervous that I couldn’t bear to smile at him or even glance at anyone else. I stared at my feet and legs, wrapped in what looked like a moon suit, and tried not to think about the alien landscape that lay ahead. Suddenly, I heard the dry crackle of tires on cold snow. I looked up and watched the other cyclists launch toward a narrow corridor that cut into a tangle of trees. Skiers and runners nudged around me. Like a diver who waited too long to come up for air, I jolted out of my daze and struggled to join the surge. The first few miles of the Susitna 100 were routed through a dog mushing park, a tight maze with trails darting off in every direction. I skirted around skiers and runners and spun my heavy legs as fast as I could muster, hoping to catch the pack. Amid a rush of adrenaline, all of my pre-race fear had been replaced by an elated sort of anticipation. “I’m in a race,” I thought, “an actual race!” Everything I had studied about endurance racing prior to the event - the nutrition, the hydration, the pacing - dissolved into the simple novelty of “racing.” I pedaled faster. My blood surged. I attacked hills with no one in front or behind me. 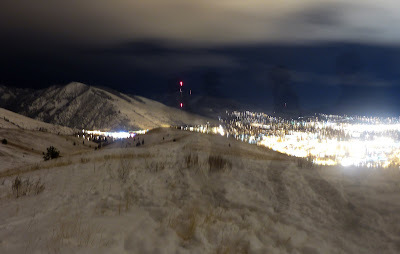 I skidded down steep waves of snowmobile moguls as my rear tire bumped loudly against my seat-post rack. The trails were hard-packed, and I managed to put every skier and runner behind me, and catch a few cyclists as well. I felt great. I pounded out the first 10 miles in less than an hour. Snow bike endurance racing was easy. Then the dog mushing park and surrounding neighborhood trails ended, and just like that, Alaska emerged. Snow drifts stretched across flat, frozen swamps, with only yellow stakes to indicate the presence of a trail. I stepped off my bike and walked through the sugary powder, something I had practiced a lot, so the effort didn’t faze me. A cold wind blew from the direction of solid white mountains in the distance. 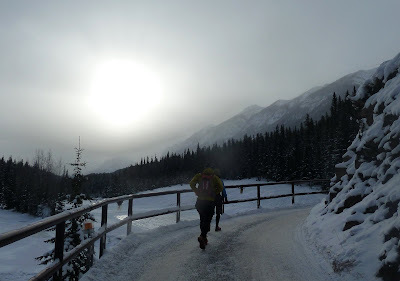 The humidity was high and the temperature hovered at about freezing, which made the snow covering the trail at once crusty and soft. I pedaled and walked, walked and pedaled. Skiers passed me. Wide bike tracks in the trail indicated most of the cyclists could ride what I could not. I struggled up short, steep climbs. My tires continued to bump against my seatpost rack on every descent. I tried to readjust the rack, but couldn’t position it higher because the saddle was in the way of the gear bag. I finally just decided to gamble that the whole thing wasn’t going to blow apart in the duration of a 100-mile race. I dropped onto Flathorn Lake and pulled up to the 25-mile checkpoint at 12:45, having covered the first 25 miles in just under four hours. It seemed a decent pace, and if I could hold it, I would reach the finish by 18 hours, my best-case-scenario goal. 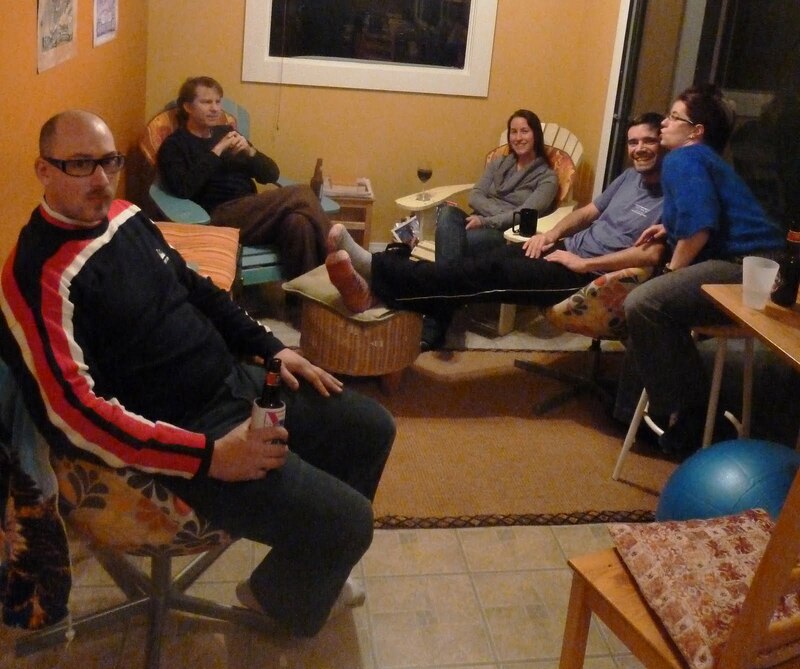 The inside of the cabin was blissfully warm, and there were homemade brownies and orange slices on a table. I refilled my Camelbak bladder and started gulping down food. Every sugary, gooey, juicy morsel slid down my throat like chunks of heaven. I had never tasted food so fulfilling, so delicious. I had never tasted food in a race before. When I walked back outside, hints of sunlight were starting to break through the clouds. I rode along the shoreline of the lake until the trail wound back into the forest. I stopped to gaze across the white expanse behind me. A warm, stinging sensation filled my throat - a physical reaction to the sensation of being at once completely at home and completely out of my element. Only the wind broke a lasting silence. 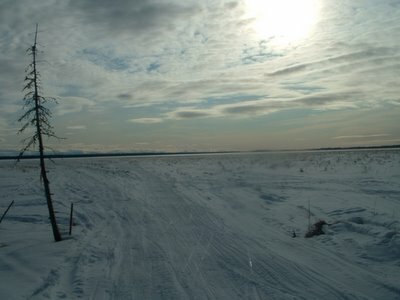 A strip of spruce trees lined the horizon, carving a thin black brush stroke across the white canvas of the lake and Mount Susitna. I had never seen such a place before, a place so beautiful and so surreal, a place so distant from the din of modern life that it seemed frozen in time. Sugar and endorphins surged through my blood and I didn’t know whether to cry or sing. But I remembered that I had already made a decision to race, so I turned and pedaled into the woods. I crossed the Susitna River at mile 33. Across the frozen white corridor, a gray figure moved along a stand of trees. I squinted as the figure stopped briefly. I saw the shine of eyes, then it turned and darted into the woods. A wolf? A lynx? What else could it be? The warm, stinging sensation filled me again. This was not my place, this was the place of skulking moose and prowling predators. This was their home, and my presence in it meant nothing to them. The realization filled me with a sense of meaningfulness, because the world was so big and I was so small. 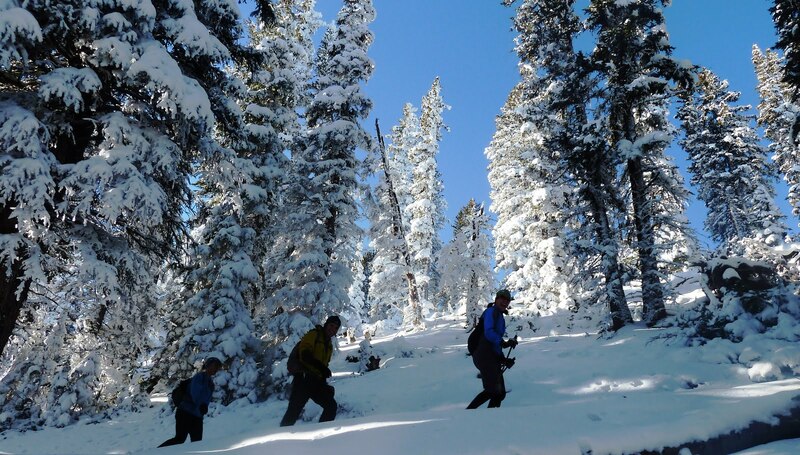 Back in the woods, two snowmobiles passed me and churned up the soft trail ahead. Where I had been riding slowly before, I was again reduced to walking. A skier caught up to me, and we moved together for a while - he could do little more than carve parallel tracks in the sand-like snow, which matched my pushing-riding-pushing pace. We chatted a bit, words I no longer remember. He stopped at Eaglesong and I decided to keep going. I wanted to make it to Luce’s Lodge by dinnertime. The trail between the two checkpoints was only a connector created specifically for the race. It was narrow and not very well packed. I walked and pedaled, pedaled and walked. I gnawed on Power Bars which, despite the mild temperatures, were frozen solid. Chocolate-flavored saliva bubbled out of my mouth as I tried to chew. Darkness fell as I reached Luce's Lodge, at about 6 p.m. I was beginning to feel woozy and decided to skip the spaghetti dinner I had planned to eat at the checkpoint. The warmth inside the building added to my wooziness, so I made a quick exit. 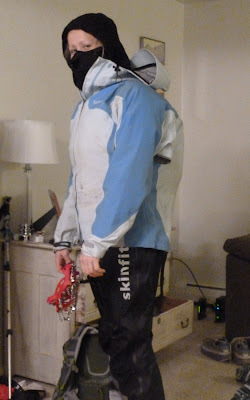 A skier on the porch was removing his hat as I stepped outside. His face and hair gave him an uncanny resemblance to a friend of mine back in Utah, Curt. "Hi Curt," I blurted out before I caught myself. The skier shot me a blank stare and without another word, I rushed away. "Wow, I must really be out of it," I thought as a hurried down the hill, back to the cold darkness of the Yentna River. My mind played backward through the slow march of the day. I had been racing for nine hours and traveled 53 miles across a remote expanse of frozen river valleys. Nine hours was as long of a day of cycling as I had ever put in. Two of my training rides were eight hours long, and once three years earlier I rode for nine hours straight during a cross-country bicycle tour. 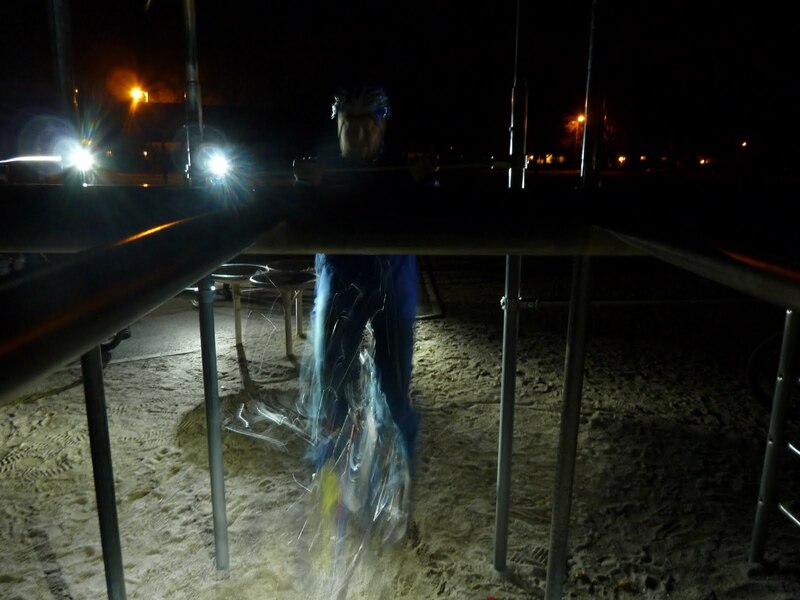 But this effort was beyond anything I had ever experienced, and I was only halfway done. I smiled with a sense of supreme satisfaction. Out on the river, the once-expansive landscape dissolved to the flickering beam of my single headlamp. I strained to pick out the yellow Su100 stakes amid the black void. I was terrified of losing them, as though they were the only thing tethering me to Earth. The river was too wide to see either side, and the darkness beyond my headlamp beam was all unknown. I was a tiny island amid an ocean of emptiness. I might as well have been pedaling on the Bering Sea. My breath felt strangely labored, my lungs and throat raw. I stared at the yellow island in front of me and wondered what being in this race really meant. Venturing beyond the safety of urban development into a wilder region of the Last Frontier had been a fantastic adventure, but the Susitna 100 was more than that. When I looked down at my hands, wrapped in gray neoprene, I saw hands capable of piloting a bicycle across frozen swamps and over snow-covered hills. When I looked at my legs and feet, hidden beneath wide overboots, I saw limbs that could propel my body no matter how tired my mind might become. When my breath swirled in front of me, I saw distant shadows of myself, the shadows of fear and doubt and insecurity, dissolving into the cold air. And when I glanced behind me, I saw the empty expanse that I had somehow managed to cross, under my own power, with my own gumption. With every passing mile I was transforming, from "just Jill" to something else entirely - a racer, perhaps. Up ahead, a bright circle of light broke the darkness. I grinned and pedaled toward it. The soft snow on the trail kept my speed to a minimum - 5, maybe 6 mph on my odometer. But I was pedaling. The distant light flickered and glistened. Minutes passed, and then miles. Then an hour passed. Uneasiness began to gnaw at my confidence. The light didn't seem to be getting any closer. I did feel pretty out of it. Was I moving at all, or in the midst of my excitement had I somehow forgotten to pedal? I looked down at my odometer. It still registered miles passing. I squinted toward the light and sighed. There was nothing I could do but keep on pedaling. Two hours passed between the time I first noticed the light and the moment I finally pedaled toward an open canvas tent, a generator and a small fire right on top of the river ice. In that time, I had traveled just over eight miles on infuriatingly flat and wide river ice. The checkpoint was perched at the intersection of the Yentna and Susitna rivers, and designed to point competitors in the right direction, so they didn't end up miles the wrong way down the Susitna. In my excitement at seeing the tent, I veered off on the wrong snowmobile trail and had to push my bike through a quarter mile of knee-deep snow to return to the right trail. As I slogged toward the tent, a man waved wildly at me as though I hadn't yet figured out I had gone the wrong way. He introduced himself as Rich Crain and dished me up a cup of lukewarm soup without me even asking. I sipped the soup and asked him about the trail ahead. "It's all stuff you've done before now," he said. "You're back on the lollipop stick. Might snow tonight. Shouldn't be too bad. You only have about 35 miles left to go." I pumped my fist and waved goodbye to Rich. I had made it all the way back to the Susitna River, and everything in front of me was terrain I had seen before, which I already knew was mostly good trail. I grinned because I felt like I had the Susitna 100 nearly in the bag. I didn't yet realize that my race was just getting started. No sleep 'til Courmayeur from Jill Homer on Vimeo. Beat sent me his video clips from the Tor des Geants, and I asked him if he minded if I edited some of them into a short video. The Tor des Geants, held this year from Sept. 12 to 19, is a 200-mile race through the Italian Alps, with a couple dozen passes, rough and rocky trails, and nearly 80,000 feet of climbing. Beat finished the race in 132 hours - more than five days - on less than five hours of sleep. He said he didn't necessarily think racing on no sleep made him faster - if anything, he admitted, not sleeping probably added to his overall time because it slowed him down. No, he just wanted to see what it felt like to race something like the Tor des Geants on no sleep. One thing I love about Beat is that he, much like me, values experiences much more than results. He also, like me, manages to finish most of the crazy things he sets out to do. When I threw together this video, I didn't intend to try to convey the entire experience of the Tor des Geants, just touch the surface of what it might be like to barely sleep for five days and cross 25 crazy steep passes in the Italian Alps. I'm sure if Beat made a video it would be very different from this. He does have a bit more footage, mostly video diaries of how he's feeling and what he's doing, that would be fun to edit as a narrative video. But for now, I have "No Sleep 'til Courmayeur." The music is "Happiness" by Built to Spill. Have I ever told you the story of the 2006 Susitna 100? I know it’s out there — this blog essentially blossomed around my training log for that race. I wrote about my experiences before and after I finished. But, amid the relentless march of time, I quickly left it behind and moved onto whatever came next. I don't feel like I gave the 2006 Susitna 100 the reflection it deserved. After all, it was the pivotal moment of transition between a former version of myself — then more tentative, fearful, and inexperienced model — and the stronger, more adventurous and independent version that I’ve continued to develop in the aftermath. As with all major developments in life, this change is an ongoing process that will never end. But it began at the Anchorage REI, on a snowy November afternoon just about exactly five years ago. I was walking out of the store when "the document that changed my life" appeared in my peripheral vision: A brochure, torn, wrinkled and taped to a bulletin board. It was illustrated with a cyclist’s silhouette that had been pasted over a photo of snow-swept tundra. White text advertised “The Susitna 100: A 100-mile race across frozen Alaska.” The brochure filled me with an inexplicable sense of recognition — like looking into the rippled depths of a fun-house mirror and seeing a vague image of my future self. I tore the single sheet away from the wall and carried it into the storm. It made sense that this brochure captured my attention — after all, I had recently moved to Alaska, and in nervous anticipation for my first Alaska winter, had purchased a pair of studded tires for my 2003 Gary Fisher Sugar. So I was already a winter cycling subscriber. But what didn’t make sense is how the Susitna 100 managed to capture my intrique. 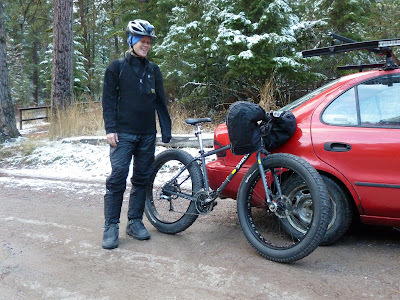 After all, I had only ridden my newly converted full-suspension mountain bike in snow a few times, and found the riding to be profoundly more difficult than the summer version of mountain biking. The Susitna 100 covered 100 miles, which was profoundly more mileage than I had ever ridden a mountain bike in a day. And this profoundly long stretch of profoundly hard mountain biking was also framed in the context of a race. I had never competed in a race before. Ever. Not a 100-mile summer mountain bike race, not a cross-country race, not a 5K, nothing. I did once enter a three-mile fun run, way back in middle school. I was the kid who hung way off the back, happier to chat with my other non-athlete friends than struggle toward the gray anonymity of mid-pack. My underachiever friends and I proudly pointed out our positions in third-to-last, second-to-last, and last place every time we walked by the results board in the hall. In the 14 years since, nothing had changed in my attitude, and I happily stayed far away from competitive sports. So it made sense that my initial admissions of interest in the Susitna 100 were met with disbelief and confusion. My parents, who had just recently digested my unsettling decision to follow a guy 3,000 miles away to Alaska, secretly began to wonder if someone was force-feeding me crazy pills. My friends back in Utah, who once watched me crumble into fear-fueled panic during a relatively harmless rafting trip in the warm desert, quietly changed the subject when I spoke of my impossibly dangerous fantasy. My then-boyfriend, Geoff, shrugged and told me I could do the race as long as he didn’t have to. He had even less interest in winter bicycle racing than I should have. He did, however, have a fleeting interest in competitive running, but at that point even his running had yet to develop into much more than the occasional snowshoe race. When he discovered the ski, bike and foot race offered a 50K version called the Little Su, he resolved to join the madness by training to run the “short race.” From this spark, he would eventually win the Little Su 50K after running “the hardest race of his life,” then do it again in the 2007 Susitna 100, then go on to dominate endurance runs across the country and become one of the top ultramarathoners in North America. But that’s his story. This is my story. Training for the Sustina 100 taught me that not only is training good preparation for a race, it’s good preparation for life. I froze my fingers and then learned how to keep them from freezing. 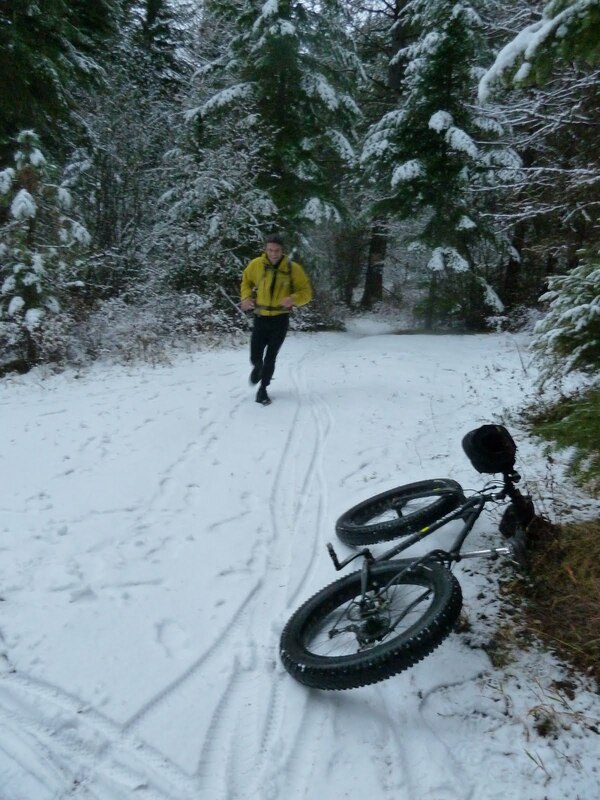 I steered into snow berms and re-taught myself bike handling. I toppled over the handlebars and discovered how to take a crash. I knelt into the snow and gobbled down peanut butter sandwiches before the chill could grab me. I pressed deep into the daunting wilderness and discovered the wilderness would embrace me back, if only my heart was open enough to accept that beauty trumps fear. Despite my training, when I showed up at the start of the race, I was an emotional, mental and physical rookie in every way, and I looked the part. The night before, I had spent 95 agonizing minutes gluing my hopelessly tight 2.1” studded tires to my bike’s 26” skinny rims (for the record, studded tires only work on ice, and are useless in snow.) Threads of the sticky substance still clung to the wheels and dangled from the spokes. For my mandatory survival gear, I had stuffed a flimsy dry bag with 15 pounds of sleeping bag, water and clothing and strapped it to a seatpost rack. I dangled a stuff sack with an inflatable Thermarest and batteries from the handlebars, and wore even more water and clothing on my back. For food, I strapped a square handlebar bag to the inside triangle of my bike, filled it with chocolate and Power Bars and added chemical heat packs to keep the Power Bars from freezing (an amusingly hopeless idea.) I wore a snowboarding coat, rain pants and thin overboots; beneath that, a fleece jacket from The Gap, polyester long johns and hiking boots, and beneath that, an actual cycling jersey and padded shorts. For my hands I had neoprene kayaking gloves and over-mittens; for my head, a balaclava and hat. 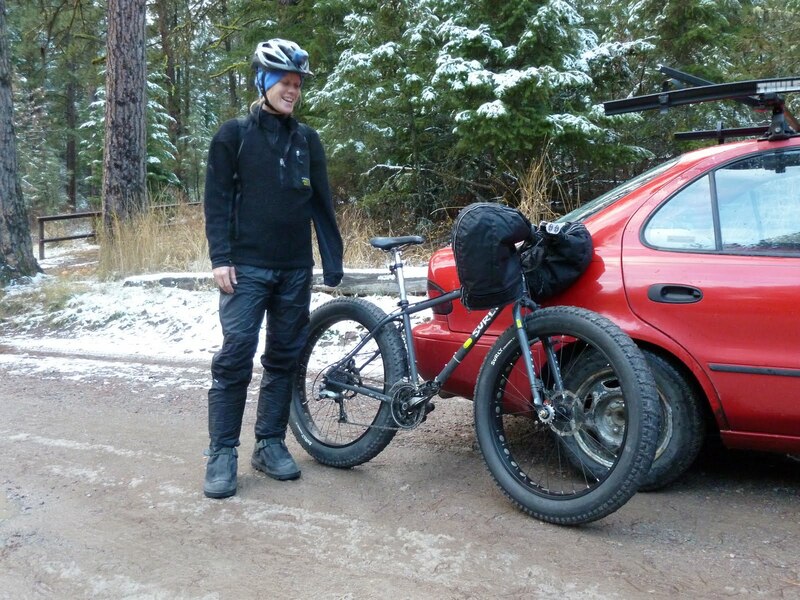 I wheeled my back-heavy, full-suspension Sugar next to rows of sleek fat bikes and sighed. I felt like I was standing at the starting line of the Tour de France with a beach cruiser. 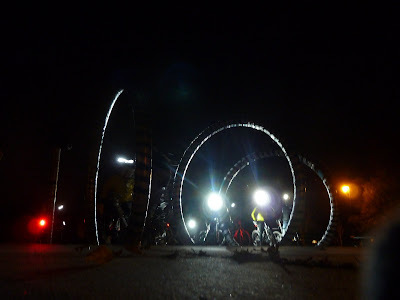 I got lucky that this week's Thursday Night Ride was a relatively inactive one, with a "skills clinic" at the park and a jaunt/sprint-before-closing to three local breweries. I can ride a bike with a sprained ankle but on Wednesday/Thursday it was still pretty tender. I sat out the skills clinic and instead used the time to test the manual setting on the Lumix camera. I was going to skip the brewery tour altogether, seeing as how I don't drink beer, but decided that a social outing was better than sitting at home and clawing at the door. I drank brewed rootbeer and Diet Pepsi, much to the dismay of every proud-to-be-a-Montanan local brew connoisseur in the vicinity. I hobbled too slowly to get many shots, but discovered that low shutter speeds on moving objects don't create a double image, but ghost the subject altogether. Interesting. One of the clinics involved doing chin-ups while staying clipped into the bike. I don't see how that's a useful mountain bike skill, but I guess this was the annual beer tour. Riding the rings. This looked hard. I was fairly grateful to have an opt-out. Beat flew out to Missoula later on Thursday night. We managed to carve out a fun weekend despite my limitations, involving trail outings where I rode my bike and he ran. On Friday we climbed Mount Sentinel with Bill. Beat ran the trail and we descended down the canyon road to avoid the singletrack bumps and jostling that really aggravated my injury. We froze nearly solid in the cold evening wind. I forget that most of the winter riding I did in Juneau didn't involve prolonged descents — thousands of feet of elevation change within a single ride is the norm around here. It's hard to dress for. 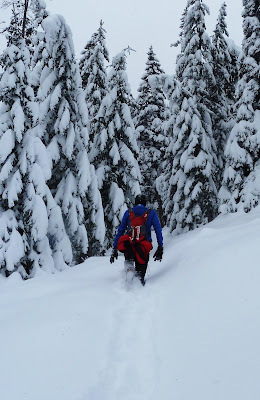 Of course you can carry extra layers, but eventually you just have to ask yourself whether it's worth carrying them just to avoid 20 minutes of discomfort, because after sweating out your base layer, it really takes a lot to hold in heat. By Sunday afternoon I was again tired of the low-level ankle babying, so we went out despite a mood-dampening mixture of snow and rain. It was the first time this season that I got Pugsley out for snow riding — although a wet inch on top of mud doesn't necessarily qualify as a snow ride. Beat had no problem keeping up with me on the climb up the Stuart Peak trail, and we continued climbing together until it became too steep and slippery for me to pedal. We got up early Monday to head back to the airport, and I was able to get out for a 90-minute dawn ride up the canyon. I also threw in a 15-minute shuffle of a run. I have a big ankle brace and was able to complete my half-mile-out, half-mile-back to my bike without pain, but it's a bit sore again now. Patience will prevail, but I can't help but watch my calendar creeping forward, and wonder if I'll ever really start running. So far success has been elusive, and I have proven myself to be more than a bit of a klutz. (I'm beginning to think of mountain bikes as safety tools invented for people like me — wilderness wheelchairs for the clumsy.) Still, I'm not giving up just yet.